Hello all! I hope you had an amazing weekend. Something that weirdly helped me when I began to eat healthier was watching those “What I Eat In A Day” videos that fitness/health vloggers always make. I watched a lot of them, some helped a ton and some didn't. There were a lot of What I Eat In A Day videos from people who barely eat and suggest you do the same, which I am not about. I watched a lot of Sarah’s Day and Natacha Oceane and I love them both because they are #fitnessgoals while eating a normal amount! Since it’s been about three months since I made the lifestyle switch of eating healthy, I finally feel like I’ve gotten it down and i’m pretty good at making food that nourishes me without sacrificing taste. I’m going to show you two examples of what I eat in a day to show you can get your macros in and not be on a strict schedule of eating the same things for every meal. I usually food prep but this week was a little off for me, so all I prepped was salmon and chicken, so most of these meals take about 10 minutes maximum to make. I also included a dessert on both days... I don’t ALWAYS eat a dessert since I prefer to keep my meals pretty clean but I wanted to show you guys (especially those just starting out, like me) that you don’t have to deny your sweet tooth! Keep in mind this is what fits my macros and your macros are probably different depending on your body type, activity level, and your goals! I was trying to lose fat and gain muscle so I was eating high protein and trying to be in a caloric deficit when my macros were like this. I’m now slowly eating more to increase my metabolism. It’s all about finding what works for you! ½ cup egg whites, 2 oz smoked salmon, 1 cup spinach, scrambled. Protein Shake with 2 scoops Chocolate Orgain Protein, 1 cup almond milk, ½ banana, 2 TBSP PB2, 1 C spinach. Honeycrisp apple with chocolate dip. Chocolate dip is 1 TBSP Almond butter, ½ TBSP Cacao, and ½ TBSP Maple Syrup mixed and it’s AMAZZZING. I also add this chocolate mix onto a sweet potato sometimes and it is also to die for! I love to make little pizzas from the Flatout brand of flatbread. All I do is pop one flatbread into the oven for about 5 minutes at 400f, top with my favorite toppings and spices, then put it back in the oven for 10 minutes and BAM there’s a delicious pizza. I’ll list what I put on mine to calculate the macros above, but you can put whatever you want on top! 2 TBSP tomato paste, 4 oz chicken breast, artichoke hearts, broccoli, olives, and spinach. The best part of the day...edible cookie dough! I give full credit to Natacha Ocean for this recipe. She made a video about it once and I would thank her everyday for it if I could. It’s that good. Protein-packed edible cookie dough? YES PLEASE. 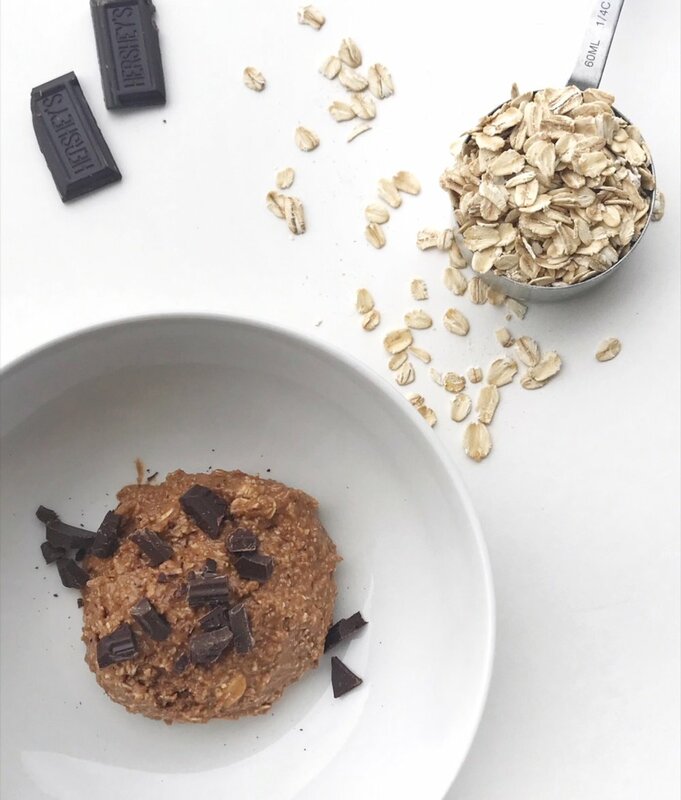 Blend ¼ c oats, 2 TBSP pb2, and half scoop of protein (I use chocolate Orgain) in a blender or food processor until the oats are a flour consistency. Add the above ingredients into a bowl with 1 TBSP maple syrup and about 2 TBSP egg whites. You may need more egg whites to get the mix to a dough consistency. I love eating it plain like that, but i’ve also added a square of chopped up dark chocolate as well which makes it taste more like chocolate chip cookie dough. YUM. So, as you can see I didn’t hit my macros perfectly, but I got them pretty close. I like to plan out my meals early in the day to make sure I get everything I need. I also like to eat protein in the mornings because I know I personally crave more carbs and fats later in the day. This is just a quick example of things I eat, if you have any questions about any of the recipes here or anything at all, feel free to ask!